Another weekend and a second First Communion in our family. One of the real joys of the Easter season is witnessing all of the ways that Christ lives around us through His Resurrection. We are all called to be living signs of the Resurrection. We learn how to be this sign through our experience with the Eucharist. Every morning God asks us “Do you love me” and it is a daily struggle to follow – to allow God to enter us, to be a part of who we are. To come to the Eucharist and say Our God Is Here. Jesus asks us to trust in Him. 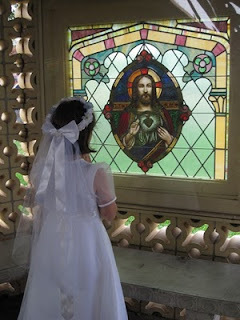 Through the Blessed Sacrament of Reconciliation we say to Jesus, “I’m sorry I didn’t trust in you.” But in the Eucharist Jesus says to us, “I trust YOU.” I trust so much that I give you this Body and Blood. I trust you to grow in love. He trusts us and loves us so much that he gave His whole self to us. Jesus knew that being good is hard for all of us. That’s why he gave us this Holy Communion. Through him we are given the strength to trust Him and make the right choices. When we receive the Eucharist, Jesus lives INSIDE you. He feeds us – not just with words, but with himself. By accepting and receiving their First Communion, our children give us a gift. They remind us what it really truly means to receive Jesus, to be trusted by Him, to let Him be our food and our strength. Their Faith is real because Our Faith is real. As our Faith is witnessed and by our children, so are we reminded by theirs that Jesus trusts US too. We belong to God. He claims us. He nourishes us with His body and blood. The Eucharist enables us to live our Faith.